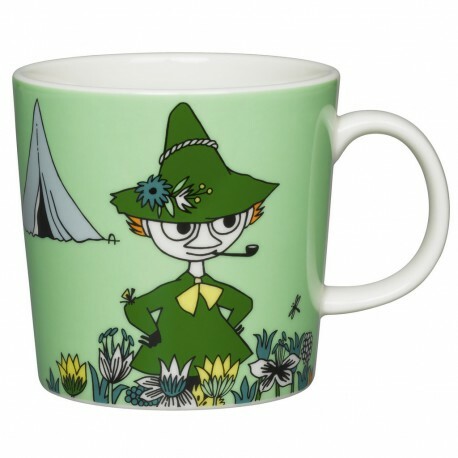 Carefree and philosophical Snufkin features this green coloured Moomin mug by Arabia. The design is from the Moomin and the Brigands in comic album #1 by Tove Jansson. Mug holds 3 dl and is beautifully illustrated by artist Tove Slotte. Moomintroll's best friend, who goes south every winter and returns in the spring. He is the son of the Mymble and the Joxter, and is half-brother to The Mymble's Daughter and Little My. Snufkin is an adventurer and a vagabond, admired by those who are small and shy. Snufkin wears old green clothes and a wide-brimmed hat that he has had since birth. He lives in a tent, smokes a pipe, and plays the harmonica. Snufkin also has a great dislike for The Park Keeper, and the many regulation signs and fences he puts up. At one point he sabotages The Park Keeper by planting Hattifatteners in his garden, causing them to grow and drive him out. He is based on Tove Jansson's friend Atos Wirtanen.